Ministerial Committee for Legislation approves Shas MK's law exempting yeshiva students under age 19 from paying NII premiums. 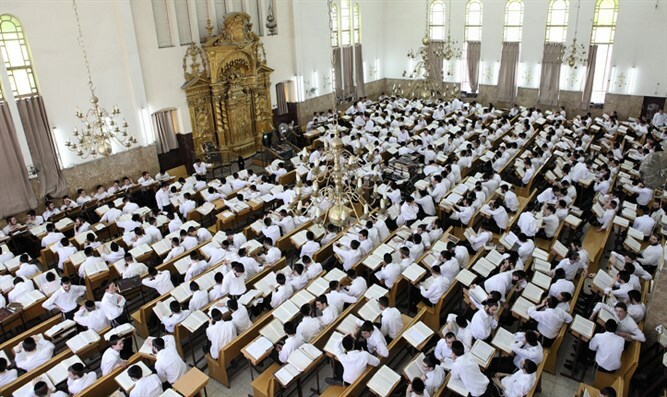 The Knesset's Ministerial Committee for Legislation approved a law exempting yeshiva students younger than 19 years of age from paying National Insurance premiums. Currently, everyone aged 18 and over must pay National Insurance premiums. Yeshiva students currently pay at a reduced rate of 125 shekels ($34) per month, while people who are unemployed and have no income pay 170 shekels ($46) a month. The new law, suggested by MK Michael Malchieli (Shas), would exempt yeshiva students entirely, but would not exempt college and university students from paying the premiums. "The new law's intention is clear: Every student enrolled in secondary school who is not yet 19 years of age will not pay National Insurance premiums. Since the Israeli government recognizes, supports, and funds yeshivas as secondary schools, there is no reason their students should pay National Insurance premiums. "The current law is discriminatory and wrong. The new law will fix this distortion and carry out the original law's true intentions, by removing the inappropriate discrimination." A few months ago, Malchieli sent a letter to National Insurance Institute CEO Professor Shlomo Mor-Yosef, but received a laconic response. Malchieli therefore decided to turn to the Knesset and enact a law forcing the National Insurance Institute to accede to his request. Shas party head and Interior Minister Aryeh Deri said, "I am happy that this important correction has been made. This places yeshiva students on equal footing with students in other secondary schools and eases their financial burden. I thank MK Malchieli for this important law. "The Shas party will continue to work for the benefit of society's weaker sectors, just as we worked to lower the costs of public transportation and water."